YES! 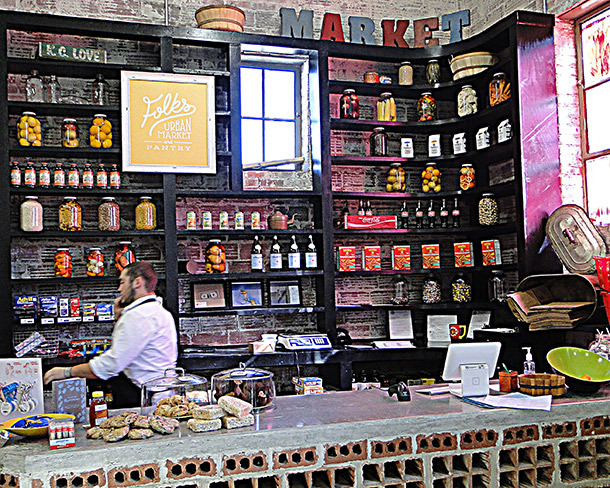 Finally what downtown has been oh-so-patiently waiting for; an independent Tulsa-born grocery establishment that fills the void with thoughtful selections that strike an ideal balance between epicurean novelty and convenience market practicality. Folks Urban Market & Pantry shines in the vibrant Brady Arts District by bringing its unique character to a superb eclectic shopping experience, that includes a heartfelt focus on stylish quality and keeping locally-sourced foods available year round. I spied local items from Canyon Ranch, Bootstrap Farm, Lomah Dairy, Antoinette’s and Heirloom Bakery, just to name a few. 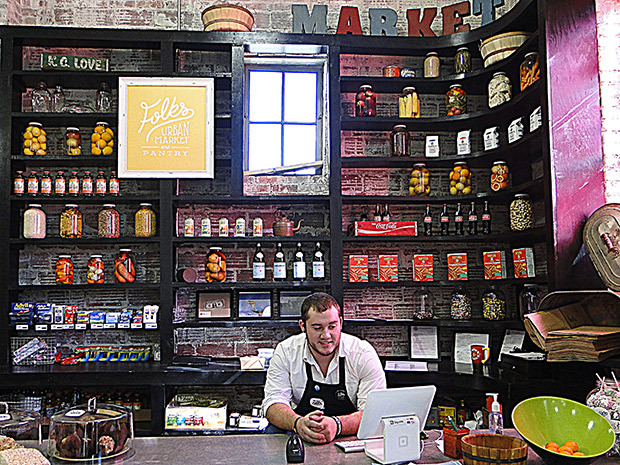 Even though Folks is still the new kid on the block and just catching their stride in building inventory, they are already everything a convenient urban corner-store should aspire to be: clean, comfortable, connected and open to the wants and needs of the community. The ambiance upon entry has a throw-back, retro warehouse vibe that’s also totally fresh and very current. The staff is comfortable answering questions and amiable to your lingering. Expect them to entice you to try one or more of their freshly made treats from their fully-functioning, fresh and vibrant kitchen. I loved their awareness of the importance of providing upscale indulgences, while recognizing the need for downscale necessities. Maybe you’re just needing a quick dinner idea for after-work? Talk to John Gibbons, Folks’ well-seasoned head chef (formerly of The Canebrake & Whole Foods), or any of his well-trained kitchen staff, for a fresh and easy meal plan. Their Grab and Go Menus are genius. If you have food preferences or sensitivities (gluten-free, vegan, etc. ), just let them know and they are well-versed in creating speciality dishes to accommodate. 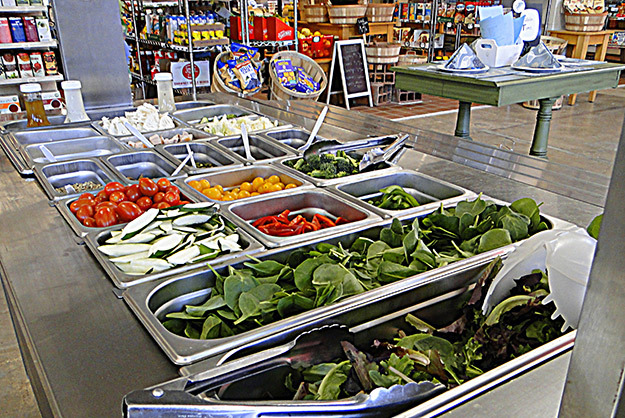 There is also a beautifully enticing salad bar that beckons you to “Eat Your Veggies” upon entering. Monday through Friday, they also offer “Table Time Dinners” that can help hard-working, busy people feel like they’ve got mealtime under-control. The Folks kitchen wizards do all the hard stuff and have everything prepped and ready so that your at-home-in-the-kitchen finishing time is well under 20 minutes. Making home cooked, real-food meals made super easy – Priceless! Such a great way to help you connect with your family and friends, without spending an entire afternoon prepping all the fresh ingredients and slaving over a hot stove to make it happen. Be sure to call ahead for details and to reserve your order. 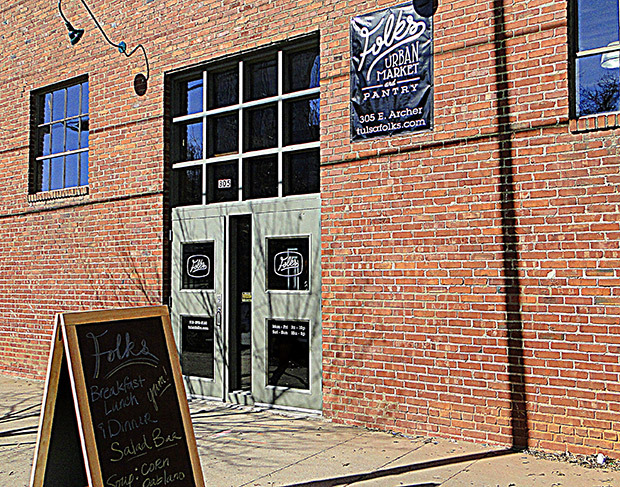 Additionally, Folks is THE place to go for last minute eats before heading over to a Guthrie Green event and it’s right across the street from Driller’s Stadium – Heeeellllooooo?! Get your picnic on with beautiful cheeses, meats, fruits, salads, locally sourced breads, and other prepared foods like bruschetta, hummus and more. Folks helps you make memories by making real food easy and accessible. What really takes this store to the next level, however, is the people. Owners Shawn and Chris Zenthoefer, and their son, Travis, are friendly, personable, knowledgeable and passionate about what they do and the rest of the staff follows suit. It’s the personal touches and the super- friendly service that sets this place apart, and to me, exemplifies what a local business should be. So why not just unplug right now and get on over to Folks to check it out? 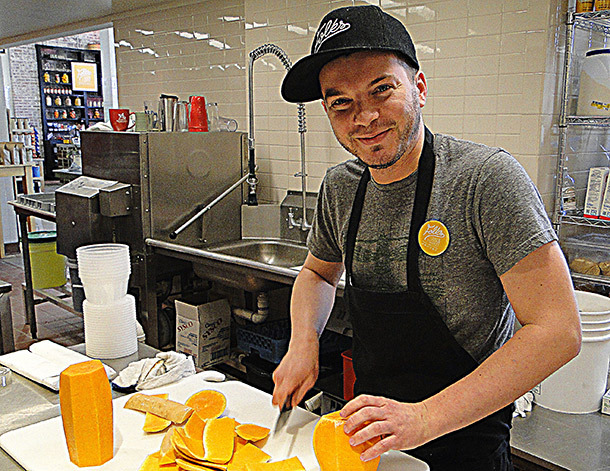 Get connected with the real people who are bringing responsibility sourced real food & personal needs to downtown. Folk Yeah!